Does our Education System Benefit from Data-driven Decision Making? 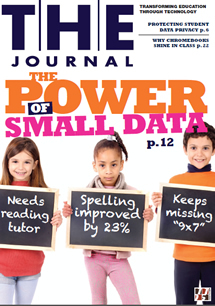 A recent article in THE Journal on “The Power of Small Data” asserts that in order to deliver personalized education, districts have to gather and share students’ statistics. The article goes on to explain how the strategic use of data can boost teaching and learning. The author was kind enough to reach out to me to provide some context for this article. My dissertation for my doctorate in work-based learning at the University of Pennsylvania focused on “Analytics by Degree: The Dilemmas of Big Data Analytics in Lasting University/Corporate Partnerships.” I was able to share my insights in higher education, and also discuss how big data has a major impact on school systems at every level. However, leadership, based solely on data, will not be successful. Educational systems need to involve key players in the community, particularly the educators themselves, to listen and ascertain what is needed most. However, sadly sometimes educators are spending so much time gathering data (and posting it) that there is little time for instruction. We need to think of how technology, data collection and the onus on high test scores impacts our next generation. I encourage you to read the full article to learn more.